How can a young man keep his way pure? By keeping it according to Your Word. Your Word I have treasured in my heart, that I may not sin against You. Give me understanding, that I may observe Your law and keep it with all my heart. Make me walk in the path of Your commandments, for I delight in it. Your word is a lamp to my feet and a light to my path. I will never forget your precepts, for by them you have revived me. I have inherited your testimonies forever, for they are the joy of my heart. Those who love your law have great peace, and nothing causes them to stumble. With all my heart I have sought you; do not let me wander from your commandments. To whom shall we go? You have the words of eternal life. Your word is truth. The law of the Lord is perfect, restoring the soul; the testimony of the Lord is sure, making wise the simple. The precepts of the Lord are right, rejoicing the heart; the commandment of the Lord is pure, enlightening the eyes. They are more desirable than gold, yes, than much fine gold; sweeter also than honey and the drippings of the honeycomb. All Scripture is inspired by God, and profitable for teaching, for reproof, for correction, for training in righteousness; so that the man of God may be adequate, equipped for every good work. Preach the word; be ready in season and out of season; reprove, rebuke, exhort, with great patience and instruction. For the word of God is living and active and sharper than any two-edged sword, and piercing as far as the division of soul and spirit, of both joints and marrow, and able to judge the thoughts and intentions of the heart. Therefore, putting aside all malice and all deceit and hypocrisy and envy and all slander, like newborn babes, long for the pure milk of the word, so that by it you may grow in respect to salvation, if you have tasted the kindness of the Lord. For the word of the cross is foolishness to those who are perishing, but to us who are being saved it is the power of God. 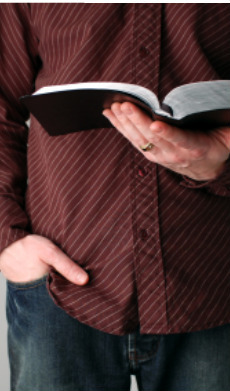 Give attention to the public reading of scripture, to exhortation and teaching. Receive the word implanted, which is able to save your souls. Be diligent to present yourself approved by God as a workman who does not need to be ashamed, accurately handling the word of truth. But prove yourselves doers of the word, and not merely hearers who delude themselves. For if anyone is a hearer of the word and not a doer, he is like a man who looks at his natural face in a mirror; for once he has looked at himself and gone away, he has immediately forgotten what kind of person he was. But one who looks intently at the perfect law, the law of liberty, and abides by it, not having become a forgetful hearer but an effectual doer, this man will be blessed in what he does. Therefore, everyone who hears these words of mine and acts on them may be compared to a wise man who built his house on the rock. And the rain fell, and the floods came, and the winds blew and slammed against that house; and yet it did not fall, for it had been founded on the rock. Everyone who hears these words of mine and does not act on them will be like a foolish man who built his house on the sand. The rain fell, and the floods came, and the winds blew and slammed against that house; and it fell, and great was its fall. Heaven and earth will pass away, but my words will not pass away. The grass withers, and the flower falls off, but the Word of the Lord endures forever. Passages used – Psalm 119:9, 11, 34-35, 105, 93, 111, 165, 10; John 6:68; John 17:17; Psalm 19:7-8, 10; 2 Timothy 3:16-17; 2 Timothy 4:2; Hebrews 4:12; 1 Peter 2:1-3; 1 Corinthians 1:18; 1 Timothy 4:13; James 1:21; 2 Timothy 2:15; James 1:22-25; Matthew 7:24-27; Mark 13:31; and 1 Peter 1:24-25.